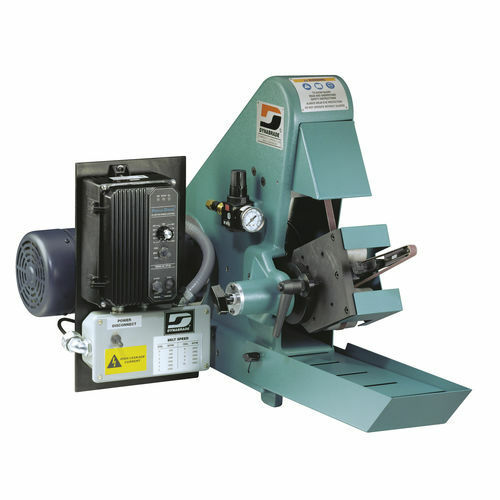 The 64881 is a belt grinding machine engineered by Dynabrade. It is specifically designed for use on various materials, such as castings and forgings, turbine blades, medical implants, investment castings and more. The unit offers flexibility in powering 72" abrasive belts from 1/4" to 2" wide. It also provides an efficient solution for finishing applications. The machine is equipped with adjustable air belt tension for constant control. It ensures operator comfort through the pivoting arm assembly. In addition, it is protected from dust, due to its through-housing 4" vacuum port.